Unter Dayne Vayse Shtern, arr. Brant Adams | Santa Barbara Music Publishing, Inc. 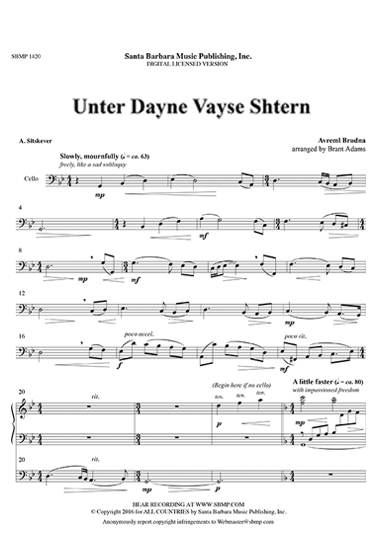 This choral score is ONLY available as a licensed ePrint PDF file directly from SBMP.COM. Due to the lack of retail or distribution involvement, composers receive 60% royalty on these titles. The famous piece by Avrom Brudno is here presented in an excellent arrangement for male voices accompanied by cello and piano. The cello part is available as a download at the web listing for the piece.